If you are interested in taking advantage of mobile advertising, you need to make sure you are using the right ad platform. Whether you like it or not mobile experiences are much more intimate and you can’t appeal in the same way you would on a desktop. Thankfully Receptiv optimizes this space and improves your ad performance by 300% while targeting customers during meaningful moments. The brand understands that advertising has everything to with the human experience and is separating themselves from the crowd with effective platform. Receptiv is a newly branded company – formerly MediaBrix – launching a new product suite: Receptiv Video Marketplace for programmatic buying and Receptiv Solutions for managed services. Receptiv’s third-generation product suite now accommodates IAB standard units, across both divisions. The company is also launching Motiv, its first-party data management platform (DMP), built on billions of mobile data points across more than 1,300 premium apps and 150 million DeviceIDs. Receptiv is offering brands more reach and control over key performance indicators (KPIs) than ever with its new product suite, featuring 100 percent direct-to-developer supply via a software development kit (SDK) that is 100 percent viewable and human (measured by Moat & Integral Ad Science), and 100 percent Video Player-Ad Interface Definition (VPAID) enabled. The video products are also IAB standard, and can be purchased as skippable or non-skippable and rewarded or non-rewarded placements. All products are deployed during emotional moments and appear naturally in context within the app environment, with an interface designed to maximize user engagement. Furthermore, all products are deployed during emotionally charged in-app moments, contextualized to the app environment, and complete with design enhancements to maximize user receptivity and engagement (which are objectively based on research, and not just subjective changes by our designers). 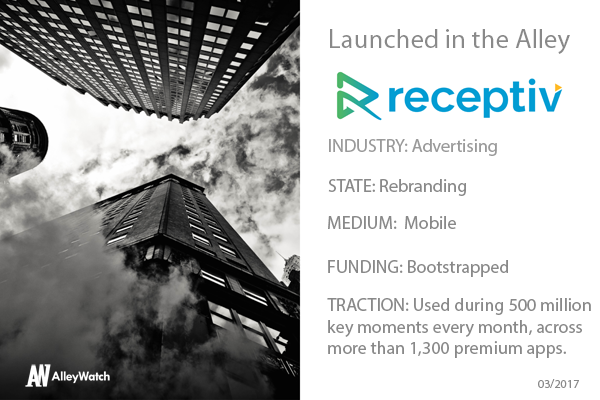 Receptiv’s offerings are meant for brands and agencies that want to serve in-app mobile video across all sorts of categories, agnostic of the channel an ad buyer chooses. The Receptiv business generates revenue through a programmatic channel, and through its managed services. Our guiding mission has already been to create the most receptive ad experiences for users – something sorely lacking in our industry. Instead, we tapped into data and insights around user experience to create ways to truly engage the user – not alienate them – and as a result of this, our offerings have become more refined as we precisely target with the most scalable, contextually relevant ads for today’s users. The digital advertising industry has evolved significant since we started MediaBrix six years ago. Who we are today is very different than who we were then, and the name change is symbolic of the significant maturation of our business operations, but more importantly, our value to our customers. Rebranding was a huge milestone for us, and moving forward, our goal at Receptiv is to scale our programmatic business to more than 30 percent of overall revenue, while continuing to build on our DMP service. The company started six years ago – and knowing what I know now, that list is very long! The amazing part of running an ad tech start-up is that the industry is constantly evolving and growing, and I’m constantly learning. New York has an incredibly talented, smart and ambitious talent pool – people with big ideas, new ideas, and the passion to create and innovate. Add that to the fact that every major ad agency has presence here, as well as many brands, and the answer is clear why New York is our home.